How big is baby? The size of a pumpkin! Baby Development FYI: Baby is about 18.9 to 20.9 inches long and weighs about 6.2 to 9.2 pounds. Her head is now about the same circumference as her abdomen. She may have about an inch or so of hair already. She’s slowly shedding that white goo on her skin (called vernix caseosa) but you might see some of it at birth. My body has been invaded, how’s that going? Feels like I’m walking around with a bowling ball hanging between my legs. It doesn’t look like I’ve dropped, but I can definitely tell the baby has lowered. I wouldn’t call them cramps, but I’ve definitely been feeling…activity…in the lower part of my uterus and South Dakota. When I walk around I get a funny spasm on both sides of my pelvis. It hurts, but it makes me laugh at the same time. Then there is the ever intensifying lightening crotch. It happened while I was in the grocery store the other day, and it was stronger than what I was used too. So my instinct was to grab my crotch and hold on. Thank goodness there was another woman shopping in the same aisle who thought nothing of it! The extreme exhaustion has hit again, but I’ve been praying for the nesting to kick in any day now. My house needs it. What’s been on my mind? Whether or not to get my cervix check at my appointment this week. A) Who would voluntarily want something or someone to go up yonder? B) Even if you’re dilated or effaced, you could still have another 3 weeks, but I would still get more ancy. C) If I wasn’t dilated or effaced at all, I would feel discouraged. I decided to get checked anyway out of curiosity. To break the ice of getting “checked” so it wouldn’t be such a shock when they do it a million times at the hospital, and honestly, it wasn’t bad at all! And I did want to know if what I had been feeling all week was due to progress my body was making. Crazy Cravings: Rolo McFlurries!!! So dang good. Mini chocolate peanut butter cups from Trader Joe’s. And pumpkin seeds also from TJ’s. Highlights: Doctor’s appointment. I’ve gained 0.4 lbs since my last visit (woo). I’m currently 1 cm and 50% effaced. 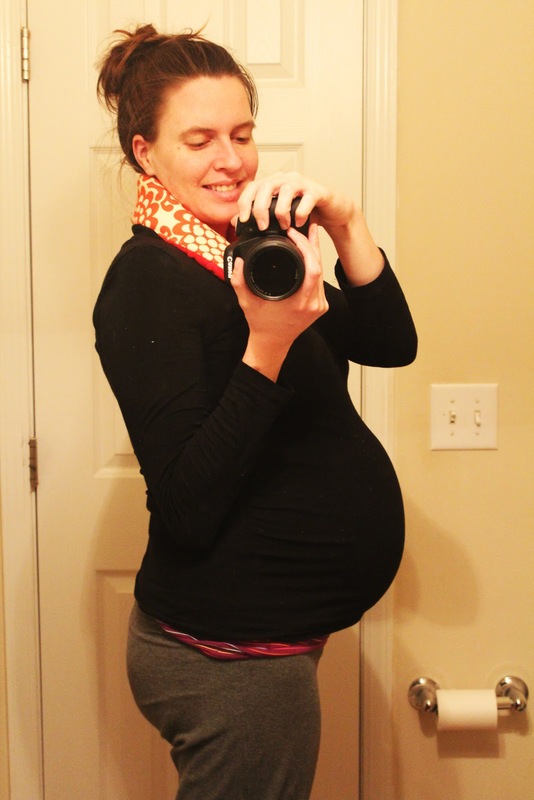 The OB said I’m measuring on the small side, but in the normal range…which I’m ecstatic about, because I really don’t want to push out something larger than the bowling ball I use (8 lb ball). And, the OB did confirm (again) I could pop any time now! You are so close!! I'll be thinking about you these next few weeks. I can't wait to read about your baby! You sound nearly as “skeered” as I was. That was thirty years ago. It was fine and you'll be fine! Can't wait to read more! You're almost there! Good luck with the last few days/weeks of your pregnancy! Oh, and by the way, you now have me craving a rolo mcflurry – and I'm not even pregnant!Stopping by and now following from Mommy Moments. Have a great week! Stopping by to invite you to join in on a link up that I host. It's all things pregnancy, baby, and birth.We'd love for you to join us!http://myjoy-filledlife.blogspot.com/search/label/My%20Pregnancy%20Journal%20Link-UpBlessings!